Cliff Atkinson asked if I would show how to draw a stick figure, so I decided to let you in on a little trade secret: All stick figures are not created equal. 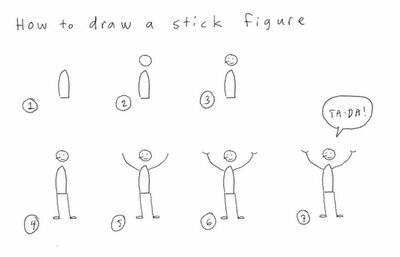 Today I’m going to teach you to draw a stick figure the way we do it at XPLANE. Stick figures are a quick and easy way to visually represent the human body doing just about anything. I’m going to start you off easy by showing you how to draw a simple standing figure. Here’s a larger image of the drawing above. 2. After you have drawn the body in the position that you want, draw in a circle for the head. The placement of the head in relation to the body is essential. Happiness, angst, speed and sluggishness can all be conveyed by the relative positions of the head and body. Observe people doing their daily routines and you’ll see what I mean. 4. Add the legs next — they are more essential to conveying the gesture than the arms. When my basketball coach taught me to shoot, he explained that the primary energy that propels the ball comes not from your arms but from your legs (Watch some basketball on TV and you can actually see this). The energy of a stick figure works the same way. Note the use of small ovals to represent feet. This helps connect the person to the imaginary ground. 7. Of course you’re drawing the stick figure to convey some idea, action or emotion. Thought bubbles and word balloons are a great way to round out the complete thought. – How would you draw a tall person? A fat person? Someone with long hair or a beard? – Go to a public place and see if you can capture the gestures of the people around you in stick-figure drawings. This is a great way to hone your observation skills. – See if you can draw people running, dancing, fighting and sitting. – Here’s a hard one: draw a stick figure riding a bike. Please send me a link to your drawings so I can share your successes! Read more about sketching in visual thinking school.